Some back-end things are a pain, especially making custom classes for elements in the WYSIWYG editor portion of WordPress. Say for example, you want to add in a “pdf” class to links you add, so we can custom style them on the front-end. There’s plenty of solutions online that will allow you to set up a new drop-down selection box for adding custom classes. Even the awesome TinyMCE Advanced features this option. But even then, it’s not exactly intuitive or user-friendly. 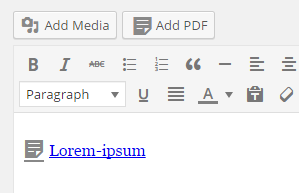 You have to add in a link, through “Add Media” or otherwise, then once it’s in the editor, select the link, then apply the new style. It’s a hassle. Especially for non-tech savvy clients. 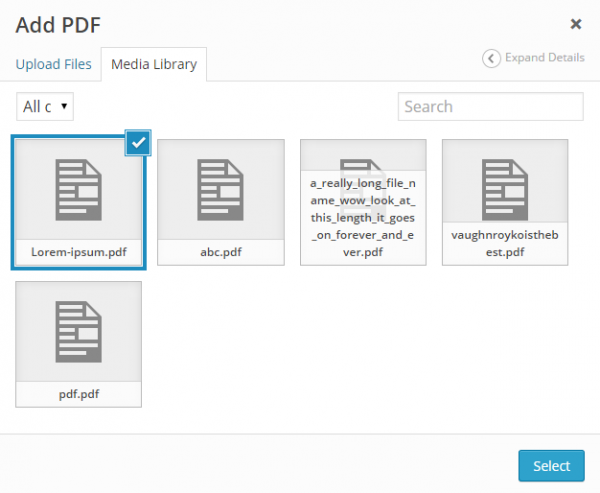 This guide will go through the steps for adding your very own “Add PDF” button, right next to “Add Media” that will do everything for us. I’m using PDFs in this example, but you can do this for any kind of file, or even multiple types. This guide expects you have some WordPress editing knowledge. So open up your theme’s functions.php file, and let’s get to work. First let’s add in our button that gets output next to the “Add Media” button. This will add in the functionality of once our new button is clicked, open a new media frame with only PDFs shown. It also adds in an event when one is selected, place a link in the editor with our desired “pdf” class. This would go in your theme’s main CSS file. Again, it’s just an example. You’ll need to grab your own pdf image/graphic. I’m not sure. 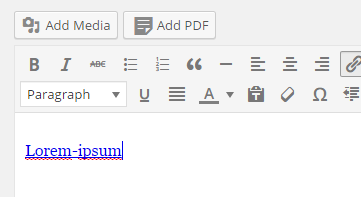 Just tested this in WordPress 4.6 and seemed to work on my end. What is the error you are getting? I assume you might be getting one via JS in console. how can I get size of attachment in add-pdf.js?